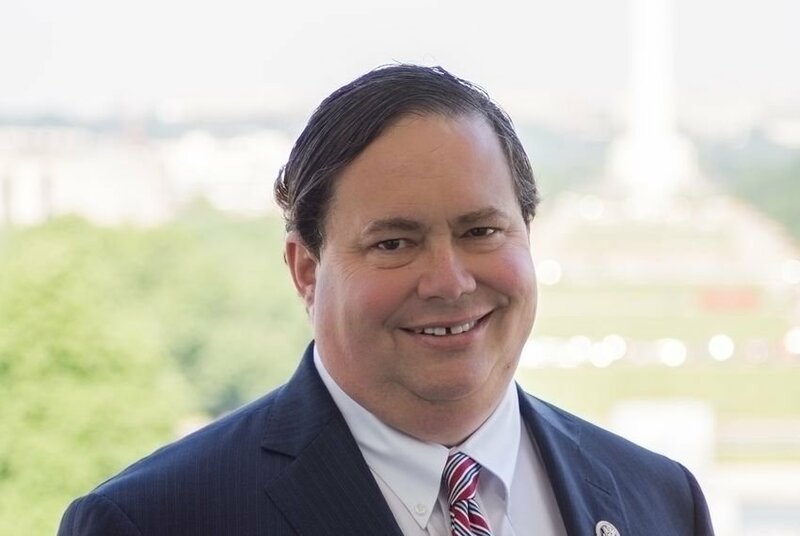 Despite speculation he might withdraw his re-election bid, U.S. Rep. Blake Farenthold appears on track to run for a fifth term. WASHINGTON — In the face of a storm of controversy and a slew of challengers, U.S. Rep. Blake Farenthold indicated Monday he's still running for re-election. "It's lonelier than it's been in past times, but he's not alone," said Farenthold's chief of staff, Bob Haueter, on Monday evening. Farenthold found himself at the center of the sexual harassment firestorm engulfing the U.S. Capitol on Dec. 1 when Politico reported that he had settled a sexual harassment lawsuit using $84,000 in taxpayer funds. Farenthold fiercely denies the accusations, both in public and in private, and he quickly pledged to pay back the $84,000 involved in the settlement. The issue initially faded away in 2014 after the settlement and after the U.S. House Office of Congressional Ethics, an advisory arm of the House, recommended the member-driven U.S. House Ethics Committee dismiss the charges against Farenthold. The controversy continued to dog him after the U.S. House Ethics Committee announced recently that it would give the allegations a closer examination. Then on Friday, the Houston Chronicle reported that Farenthold and his entire congressional staff underwent sexual harassment training in 2016 after the he was accused of gender discrimination. And late Monday, The New York Times published fresh accounts culled from former staffers and legal documents describing Farenthold's office as a "hostile work environment, rife with sexual innuendo." All this sets the stage for the fight of Farenthold's career. Five Republicans have launched bids to unseat Farenthold in his 27th Congressional district, most prominently former Texas Water Development Board chairman Bech Bruun, who resigned from that post and filed to run as a Republican for the congressional seat Friday. Others include Michael Cloud, a member of the State Republican Executive Committee and former chairman of the Victoria County GOP. On the Democratic side, at least four Democrats have lined up for potential campaigns. Democrats are candid about the seat being out of reach for them, meaning Farenthold’s biggest hurdle is in the GOP primary. The crowded field increases the odds of a runoff, and a rule of thumb in Texas politics is that it is near-impossible for an incumbent to survive the second round of a primary. Farenthold's political troubles come amid — and in large part due to — an environment of increased sensitivity to sexual misconduct in Washington, D.C.
Two female Republican members from out of state, U.S. Reps. Mia Love of Utah and Barbara Comstock of Virginia, have called on Farenthold to not just retire but resign. Democrats last week purged two favorites from their ranks: U.S. Sen. Al Franken of Minnesota and U.S. Rep. John Conyers of Michigan announced their resignations. Franken did so in a highly reluctant matter, suggesting he was a sacrificial lamb to allow Democrats to attain the moral high ground on the issue of sexual harassment. Liberals then quickly made Farenthold the poster boy of alleged harassment, and they demanded he resign. Failing that, they urged GOP leadership to push him out. But leading Republicans — and Texas delegation members — remained silent. Democrats were quick to construe that as tacit approval of Farenthold's alleged behavior. In interviews with a dozen or so delegation insiders, they say it is a different story behind the scenes. Texas Republican members would prefer for Farenthold to step aside (he has until Tuesday to withdraw, but there are few signs he intends to do so). At the same time, there is little interest in publicly knifing him — that’s just not how things are done in the tight-knit delegation. Even so, if a new and credible allegation surfaces, Farenthold could see the political ground swiftly shift underneath him. Most Texas Republican operatives predict his fundraising will dry up amid the bad publicity, and it’s unlikely GOP colleagues will rush to donate to his campaign, the common practice when a longtime incumbent is in political trouble. Despite all of those developments, Farenthold’s close advisers are sticking with him, and there is a clear sense of ire within his inner circle that the Office of Congressional Ethics' investigation and dismissal recommendation did not put the story to rest. A group of past and current employees circulated a letter defending Farenthold, describing him as having “always treated us fairly and with dignity and respect." And he has the support of a prominent figure in Texas state politics: pollster Chris Wilson. Cassandra Pollock and Patrick Svitek contributed to this report.